O Ali, no gravity is harder than ignorance, no wealth is more beneficial than wisdom, no loneliness and roving is more fearful than egoism and no request is better than consultation as well as no wise is as providence, no pride is as well-behaving & no pray is as though and idea. O Ali, lying is pest for word, forgetfulness is pest for knowledge, laziness is pest for pray, and gracing is pest for generosity as well as cruelty is pest for bravery, egoism is pest for beauty & pride is pest for family honor. O Ali, advice you to honesty, never tell lie, never do a treachery& has such fear from God that you can see him, devote your body & property for your religion & have good behavior & be away from bad characteristics. O Ali, three actions are in goodness of behavior: be friend with your enemies, forgive people whom don’t forgive you & are cruel to you. O Ali, if these three features aren’t in someone, he/she won’t be successful: The probity saves individuals disobeying from God. The knowledge saves unwise people from irrationality. The wisdom helps people to be friend. Someone who starts the day with greedy undoubtedly has wrath to God & someone who complains from the sadness is complained from God & someone who see himself/herself poor in dealing with rich, has lost half of his/her religion & those who ridicule divine Ayah are from hell. O Ali, three things perish & three things save: obeying ego, covetously& egoism will perish you. But, fairness in happiness & anger mode, fairness in wealth & gravity & fear from God in secret and open as you can see him, if you don’t see him; he sees you will save you. O Ali, four things waste: eating more than need, light in moonlight, farming in desert & goodness to incompetent people. O Ali, these four moral features are symptoms of misery; i.e. jealous, cruelty, last wish &worldliness. O, Ali, if have proper & good behavior with your family, neighbors, friends & relatives, will go higher. O Ali, punishment of 4 acts is soon: do bad behavior against goodness, cruelty to you while you haven’t done anything wrong, treachery to you while you have had honesty & unkindness to you while you have been kind to someone. There are three characteristics for cruel: suppress his subordinates, disobey his boss & assist his cruel friends. Wise man should travel only for; improving his life, being ready for judgment day, enjoying from lawful. There are three signs for lazy people: shows weakness in doing affairs so that falls to guilt and retardation, neglect in affairs so that result in corruption & wastes time so that become guilty. And there are three signs for hypocrite: if he talks, his words are lie, if he is trusted, he will betray & he will forgot his promise. O Ali, what you don’t like for yourself, don’t like for others, what you like for yourself, like for your friend; so, be impartial in your orders & be moderate in your judgment so that you will be liked in heaven & earth. 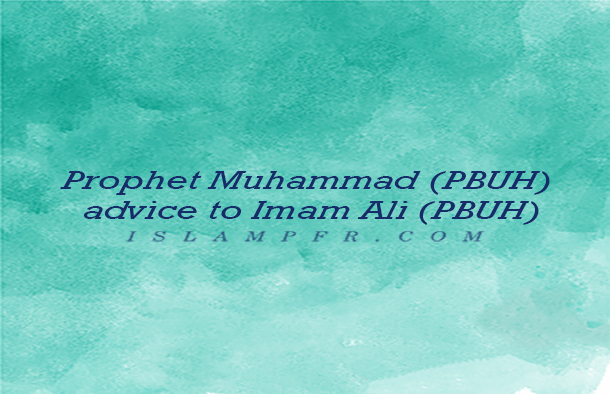 Preserve my advice according to God order. It has been presented in one part of a long and detailed Hadith that; a famous monk from Judah’s grandsons – an apostle of Jesus (PBUH) – in the name of Simeon ben Lavi asked more issues & things from Jesus and Jesus answered all of them despite being more, at last he has believed in Jesus &authenticated him. But, we have only presented main part of it. Simeon asked that L what is wisdom? And how is it? Please clarify it with its categories & parts.Jesus (PBUH) presented that wise prevents from ignorance & ego is as the worst animals, if it isn’t prevented it will be wandered. So, wise is as a bridle for ignorance. Indeed, when God created wisdom, presented that wisdom come here, it came & God ordered that go back it went back. The excellence God presented; I swore to my honor & glory that haven’t created a creature as great & obedient as you. I start with you, good reward is for you & you are responsible for punishment too. Then, tolerance & bear were originated from wisdom. And knowledgewas originated from tolerance. Awareness was originated from knowledge. Probity was originated from awareness. Refrain was originated from probity. Shame was originated from refrain. Dignity was originated from shame. Goodness was originated from dignity. Hatred of crime was originated from goodness. And advisability was originated fromhatred of crime.